It is not just about price. Consumers are looking to travel agents to provide the best overall solution to their individual travel needs. People have a tendency to immediately think price is what they want and not necessarily what they really want or, importantly, need. Qualifying the client upfront can provide a travel agent with a relevant needs assessment. This can include dates, quality or location of accommodation or stateroom, cancellation policy, recreational amenities, the ease of doing business, etc. It may not just be the price. No two clients are alike. What works for one may not work for another. Taking the time to better understand you, the client, one at a time, is what we strive to do. Price is important when it is the only thing a travel provider sells. We don't. We make vacation dreams come true. Call or Contact Us today to become another satisfied customer! 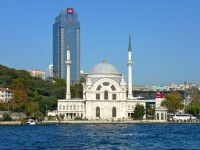 Istanbul is the only city in the world located on two continents - Europe & Asia. It has been the capital of the Roman, Byzantine & Ottoman Empires.